Well, traveling in Southern Florida is nothing like Western New York or the Appalachian Trail. The only thing similar is maybe how hot it can get! Florida is very flat and there are a lot of paved paths! 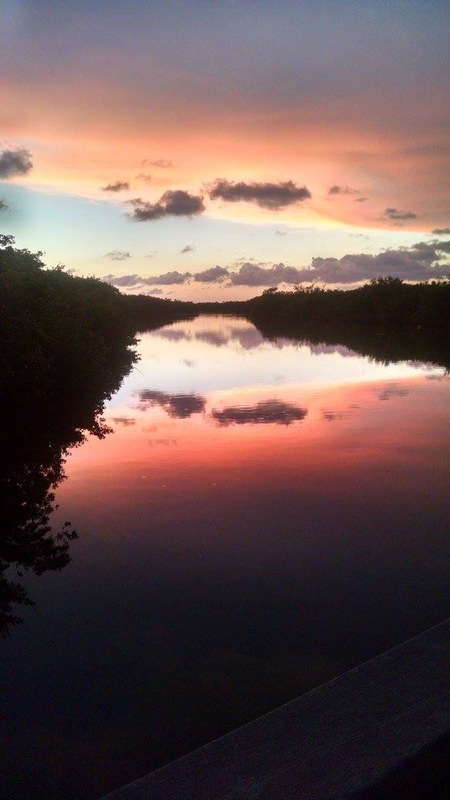 Sanibel Island is on the Gulf Coast of Florida near Fort Myers. 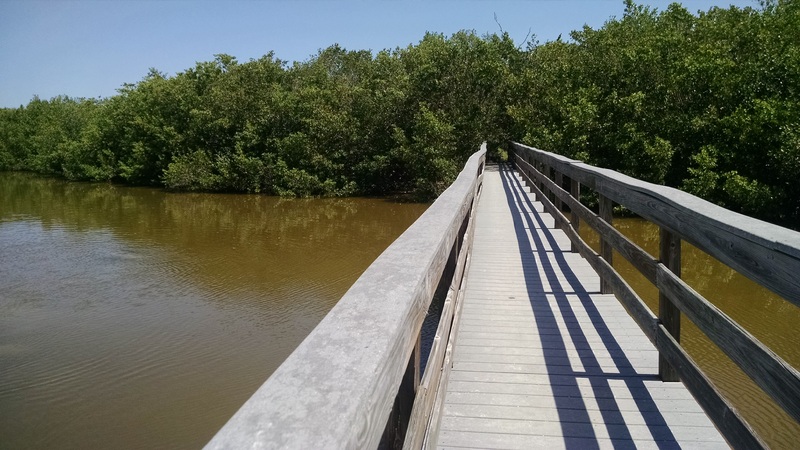 The Island is about 12 miles long and you get there by crossing a long bridge from Ft. Myers. The main attractions (for me) on Sanibel Island are the (1) BEACH and (2) Ding Darling Wildlife Refuge. 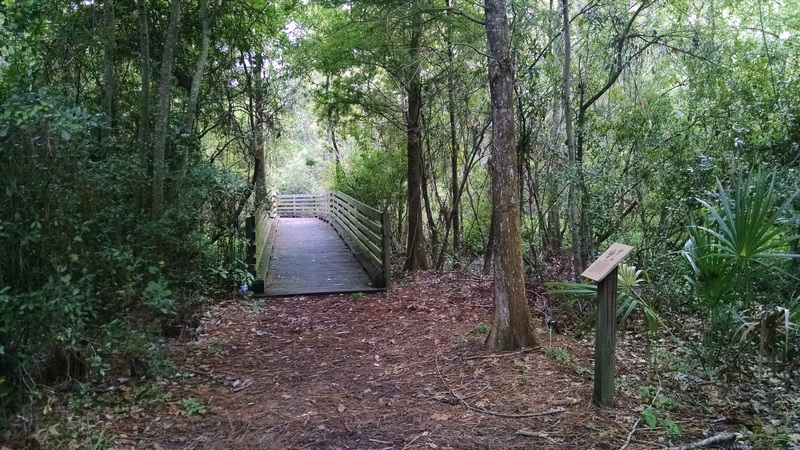 The Jay Norwood “Ding” Darling Wildlife Refuge comprises more than half the Island. There is a Wildlife Drive that you can drive your car through, walk, or bike. There are other trails that I didn’t get a chance to do mainly because it was very hot and also, I was on vacation and slept in or went to the beach! We looked and looked for Alligators, but had no luck here. One early morning, I took a leisurely drive along Wildlife Drive. I would drive a little, get out and walk and look and drive a little further. It was so quiet, only fishermen were around. I had the place pretty much to myself. Just me and a couple thousand birds! It was very peaceful and calm and I enjoyed my walk about the Refuge very much. We stayed at the Blind Pass Condos. It was located on the Western end of the Island away from the restaurants, shopping and touristy things. That was good and bad. Good that it was quiet on our beach, bad that we had to drive to restaurants, shopping and touristy things! That being said though, we were on Bowman’s Beach! The sand was soft, the shelling was super and it was never crowded. We rented bikes for the week for the kids and that seemed to help with their desire to explore. Our condo was set up with two bedrooms and two bathrooms. The owner thought of everything you might need for a beach vacation: beach towels, hats, beach toys, shelling tools, buckets, pool noodles, boogie boards, beach chairs, beach umbrellas, beach cart to lug it all, a cooler, even tennis rackets and balls if you wanted to sweat it out on the court. It was nice to have a kitchen to keep food cost down; we only ate out for dinners mostly. 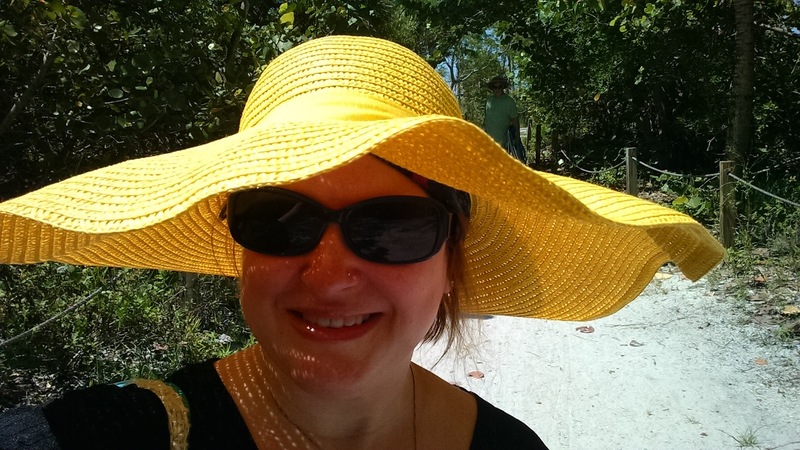 The condo owner provided the big yellow sun hat for the big yellow sun day that I wore on Sunday and every day! Back to the outside! On our condo property there was a bridge that led to the beach. The bridge went over a murky lagoon that we could kayak or canoe in. NO THANKS. That’s where we saw our Alligator!! In our entire week stay we didn’t see anyone kayaking or canoeing in that lagoon! We also saw the Manatees here. I think there were two big ones and a small one. The pictures didn’t come out well. My son’s girlfriend, Amanda, took the nice photo of the Alligator! I shamelessly stole a few of these photos in this article from her Facebook! Thanks, Amanda! Manatee with scars on her back. Poor thing! On the other side of the bridge was the BEACH! I just realized I didn’t take many pictures of the beach during the day! 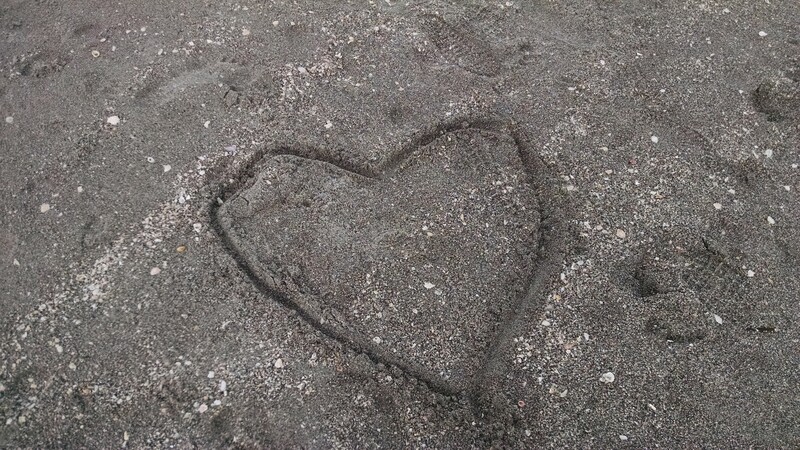 The fabulous thing about Sanibel Island is the amount of sea shells you can find and collect! I think I brought home 10 pounds worth of sea shells! I must have walked miles on that beach with my back hunched over scanning the waves. The Islander’s call it “The Sanibel Stoop.” It’s amazing I didn’t need a Chiropractic adjustment when I came home! On the beach you will see taped off areas that are nesting grounds for sea turtles. The little babies hatch and come out after dusk and follow the moonlight into the ocean, and if they see the lights in our homes they might be drawn the wrong way, so we had to close our blinds in our condo by 9:oo pm so the baby sea turtles would not be confused! I carried home almost 10 pounds! One of my most favorite times of day is sunset. The beach seems to always have an incredible view of the sun disappearing. And the sunset from the lagoon was stunning, as well. Amanda took an amazing photo! At the Eastern end of the Island is the Sanibel Lighthouse. We visited the grounds there and the beach. The beach seemed rockier on this end of the Island and had more seaweed (yuck!). Of course, I did a little geocaching! I was close to finding 100 geocaches so I decided I would find my 100th geocache on the Island! Dave and I went bike riding on the bike path, which is LOADED with caches. Then I got the fever and we found a few more with the kids. There’s a geocache here somewhere! Carl checking out the log. We also visited the Sanibel Island Historic Village. It’s a group of original and replica homes and businesses from the beginnings of residency on the Island. It was Carl and Amanda’s idea to visit and Dave and I tagged along. We were glad we did, it was really interesting to learn about the hardships the Island pioneers dealt with. There was no bridge back then and everything was brought to the Island by ferry. The hurricanes that hit the Island would often completely demolish all the buildings and they would have to start from scratch. On our way to the airport we stopped by the Henry Ford and Thomas Edison Museum in Fort Myers. We walked about the gardens and were amazed by the banyan tree. It was planted in 1925 and is believed to be one of the biggest banyan trees in the United States. This is ALL ONE TREE! Its limbs drop down to make it appear it is multiple trees, but is actually ONE TREE! It is 400 feet tall and spreads nearly an acre! These pictures just do not do it justice. We all wished we could play in the limbs and climb through it, but it was all roped off. In Tampa we checked out the Museum of Science and Industry. With my Life Membership at the Buffalo Museum of Science we got in FREE! Carl rode a bike that was on a tightrope high up in the air! Carl also finally found a brain (see photo) and we studied all about the human body. The brain on this kid is HUGE! Carl taking an eye exam! There was a really beautiful trail outside near where we parked. Too bad we had a plane to catch; I didn’t have to time to do more than take a picture of the enticing trail head. I wanted to hike on this trail so much! Wish I had more time! After a two hour plane delay, we were glad to be home. I will miss the beach, the relaxing, and the important quality time spent with my son and his girlfriend and of course, my husband! Until next time Sanibel Island! Author trailchaser2020Posted on July 7, 2016 Categories beach, birdwatching, Bowman's Beach, Ding Darling Wildlife Refuge, Florida, Sanibel Island, shelling, travelTags beach, Florida, geocaching, sand, Sanibel Island, Sanibel Lighthouse, shelling, travelLeave a comment on Sand Between My Toes!